*Whoa, here’s a shocker announcement. Sort of. After denying for months that she is engaged, we find out on a promo video for Lifetime’s new “The Houstons: On Our Own” reality TV series, that Miss Bobbi Kristina has been untruthful all along. “We’re engaged,” Bobbi Kristina awkwardly announces during a family meal in a snippet from the series premiere. 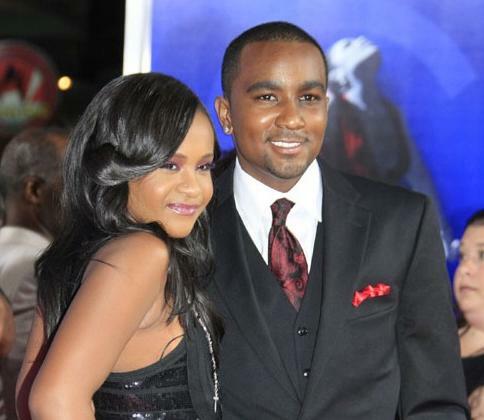 The groom-to-be is of course Nick Gordon, who the late Whitney Houston adopted as Bobbi’s brother. A fact The Houstons don’t simply accept. “The family has me out to be a bad person,” Gordon says during a confessional after a scene featuring Gary Houston (Whitney’s brother) chastising the newly engaged guy airs. Alrighty then, it’s about to be on and poppin’! Check out some more scenes from the new series below. “The Houstons: On Our Own” debuts on October 24 on Lifetime. I heard this last week anyway, so what!!! Zzzzzz!!!! LOL!!! I agree the family does look rough…..as for BK all I can do is “SMDH” at her. SMH at this train wreck. Can’t even put into words about what I just saw in the promo. Ugh! Took me way too long to look but I finally found it. My five-year-old was watching the show “Wild Kratts” on PBS Kids this weekend and they were studying the “proboscis monkey”. I’ll be damned if BK’s nose doesn’t resemble…not a good look. The aftermath will not be a pretty sight. SMH! What a shame I won’t be able to watch the video until later today, but the headline is enough. SMH in utter disgust. This is TRULY a WTF moment. Fortune hunter is written all over this guy. I hope BK isn’t foolish enough to get pregnant by him. Melody, if she’s foolish enough to be engaged to him, it wouldn’t surprise me if she got preggers. She acts like a brat and seems to think that stardom should be handed to her because she’s Whitney’s daughter. @NYC, yes so true. I totally agree. I think she is truly loving the attention these days to where she and the brother-fiance continues to stage events and announcements to keep her name flowing. This girl is completely lost and really have no idea what she is getting into. They will eat her alive. LOL @ Comments. This is all Pat’s fault!! Is that Pat’s husband in the video with the cap? If so, why does he look like a crack head? He looked diffferent in the interviews held shortly after Whitney’s death. I really wish she would get that gap fixed. This is too soon, and this child is too young. She never had good role models around her and has not lived enough of a decent life to make a successful marriage. Besides that, weren’t they just battlin’ a few weeks ago? This is not good but there probably is no stopping to her or trying to reason with her. I hope she has a come to Jesus moment before she makes this mistake. If he loved her, he would give her some time because with the blood of Whitney and Bobby running through her veins, she has to muck up some more before she’ll be good for anything. That is if she makes it through.